The Shabbona-Lee-Rollo Historical Museum had its beginning several years ago when a small group of people interested in local history and preserving the area’s past, began meeting regularly. 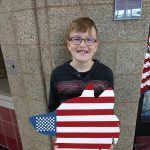 The idea was to encompass the old school district #425, which included the towns of Shabbona, Shabbona Grove, Lee, Rollo and the surrounding area. Since this area included DeKalb County and parts of Lee and LaSalle Counties, the collection of historical information spans a large area. In September, 1992 the museum opened its doors in the old bank building at 119 W. Comanche Street in Shabbona, Illinois. Our growing collection of records include obituaries, cemetery books, marriage information, census records, (microfilm), Shabbona newspapers (hard copies and microfilm), biographies, abstracts, church, school, and military records. We have a part time curator, board of directors, and many local volunteers. In 2014, a 1200 sq. ft. addition was added to the back of the building for research and additional display area. The museum is in its 26th year of service to the residents of the area. It provides and services people who are interested in displays, Historical Society programs, family research and history of the area. The museum is open from 9:00-11:30 a.m. and 12:30-3:00 p.m. on Tuesdays and Thursdays and from 9:00-11:00 a.m. on Saturdays. Admission is free. 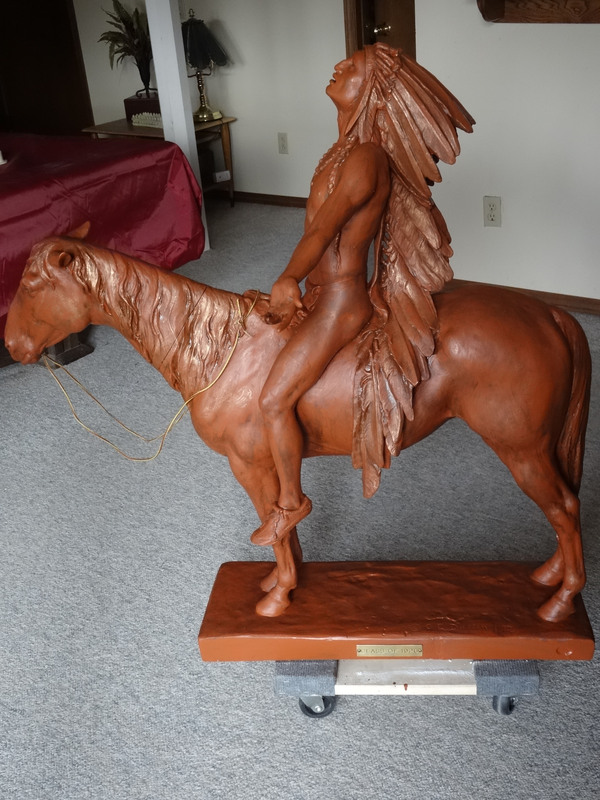 Many of you may remember the plaster statue that stood in the Shabbona Community School for many years. The museum acquired it this year and it was in very bad shape. Volunteer Alice Lintereur took it home and refurbished it. We now we proudly display the piece. There is a plaque attached to the base that says it was donated by the class of 1926 with ©C.E.D. carved above the plaque. 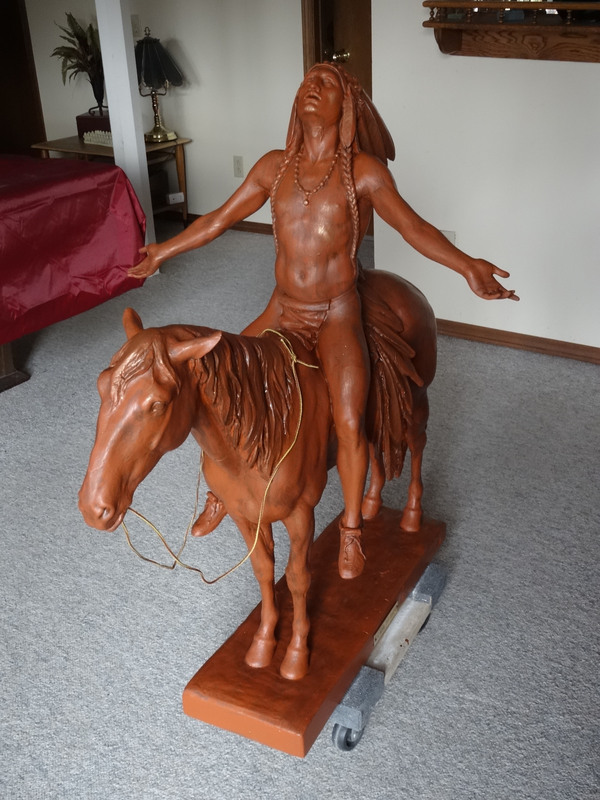 In further researching the statue, we found that is was one of several replicas of a 1909 large bronze statue “Appeal to the Great Spirit” by Cyrus Edwin Dallin which is found at the Boston Museum of Fine Arts. This fall, the Indian Creek Elementary School fourth grade students show their talent by creating a flag. The Museum sponsored the contest. All of the flags were very unique, which made it was difficult to choose the winners. 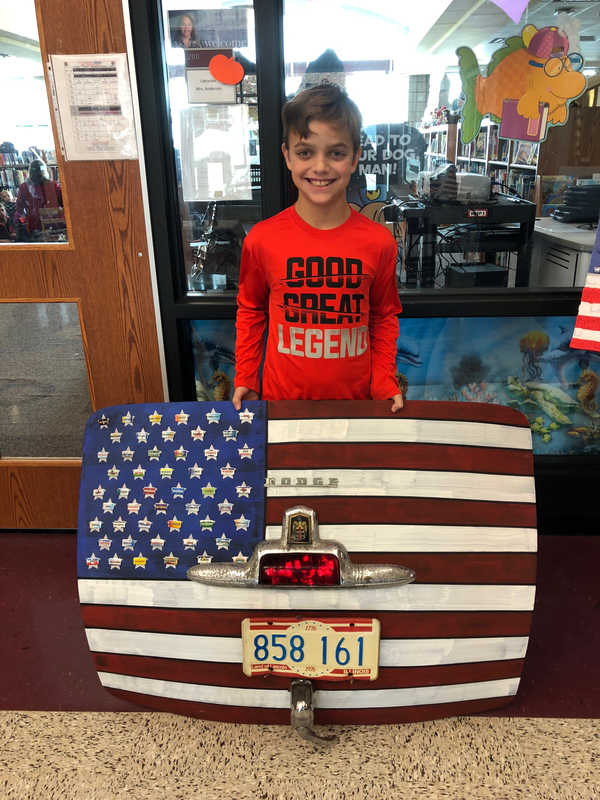 1st place, Hayden Bushnell’s flag was made from a car trunk lid. The tail light has been made to glow in the dark. Very clever. 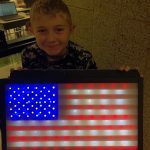 2nd place, Lucas Baird designed this light-up flag that tied to the subject of electricity that they studied. Outstanding! 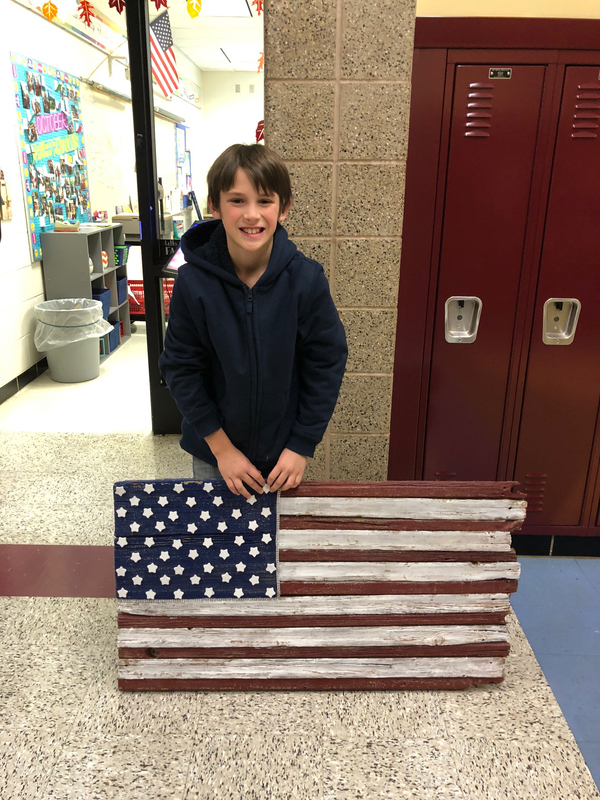 3rd place, Owen Parrilli’s flag was created out of old barn wood. 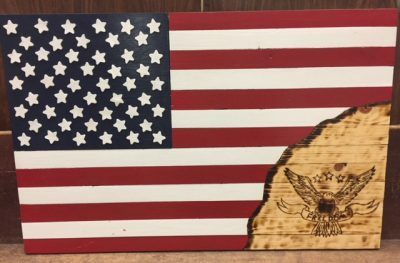 His mom suggested that the ends would look better straight, but he disagreed, saying it looked more like a flag during the war. Great job! 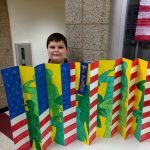 1st place, Wyatt Gletty’s flag is done in folds, like an accordion. If you look at it one way, you see the flag. If you change the angle of view, you see outlines of soldiers. Very neat! 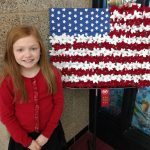 2nd place, McKenzie Greer’s flag was painstakingly made from individual flowers attached to boards. The blue section has 50 small white flowers, while the flowers on the stripes are larger. Well done! 3rd place, Cooper Simonson’s wooden flag is patterned after the head of a timber wolf, which is the Indian Creek mascot. He has painted the colors on the flag, but attached 50 small dots on the blue muzzle of the timber wolf. Good job! 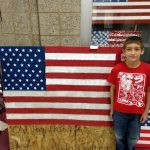 1st place, Landen Almond did a beautiful job on his flag. In addition to the painted stars and stripes on wood, he used woodburning to incorporate the likeness of the USA’s national symbol, the American Eagle. This is a well designed piece! 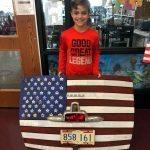 2nd place, Ryder Gallagher’s flag was made of an old fire hose which came from the Big Rock, IL Fire Department. This flag is very cool! 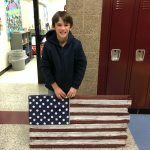 3rd place, Parker Murry took his flag to another level by painting the stars and stripes on a baseball bat. This flag is quite unique! Schnucks Grocery Store has a program for non-profits to make extra money. If you would like to help and be part of this program, stop at a Schnucks store nearest you (there is one in DeKALB) and pick up a My SCHNUCKS card. The directions are on the card what to do next. Sign into Schnucks.com and add your card number to the list donating to the SLR Museum. Each time you go to the store be sure to scan the card for your groceries or your medication. At the end of the year, the museum will receive a percentage of the total spent for the year. Thanks for your help. The men in our area were well represented in the Civil War, World Wars I & II, the Korean War, Vietnam and every action since. There are currently 18 mannequins displaying men and women in various branches of the service and conflicts and one war bride. All uniforms and the wedding dress were locally donated. The volunteers are working on our military files. In addition to the uniforms and artifacts on display, the collection includes binders filled with information on our area people who have served in the military. To include your or a loved one’s story, there is a form to fill out, or simply put together the information, which would include branch of service, date of induction, date of release, medals received, where served and any other information that would enhance the file along with pictures. Please send or deliver to the museum. This museum has a large collection of identified photos and we are constantly adding to this website. Check out our galleries. The main Gallery will include pictures from the 1800’s to the present time of people, buildings and structures, celebration and more. The School Gallery will have pictures from the first school in Shabbona (1895), class pictures from Lee, Rollo and Shabbona with identification if possible and finally the Portrait Gallery will be photos of people taken by professional photographers. Keep checking back as I add more. There are over 2000 pictures in our collection. You might even find yourself or an ancestor! The one-room school exhibit is set up to illustrate what a child would see if they were attending a classroom in one of the nearly 40 one-room schoolhouses formerly found in the area. The artifacts on display are from several of the original schools. One room at the museum is dedicated to the early kitchens that many of us remember. While the larger items include a stove and table and chairs, there are hundreds of local items donated to make the room a nostalgic place to view. Items are continually being added to the exhibit, bringing back memories to many of our visitors.